NRS Rescue is a leading provider of the highest quality swiftwater rescue equipment available. They supply a wide selection of PFDs, rafts, rope, throw bags, dry suits, wetsuits, knives, helmets, instructional rescue books and safety videos. The NRS Pro Rescue River Board is designed for swiftwater rescue professionals who need a dependable platform for providing aid. Includes all the features you need for successful deployment. Foam construction for complete reliability. Won't absorb water, stands up to lots of abuse, and it always floats. 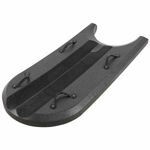 Completely slick and smooth bottom for added durability and performance. Two sets of handles let two people hang on at once. Neon green bottom for a sharp look and higher visibility. Dimensions: 56" x 24" x 4"
Special Order. Please allow additional lead time. Item is Oversized. Shipper's Surcharge: $25.00 ea. Surcharges will not display in the Shopping Cart, but will be added at the time your order ships.